While others his age were dating, attending proms and graduating from high school and college, Davontae Sanford spent his teen years and early 20s behind bars for murders authorities now say he didn’t commit. Sanford is expected to walk out of prison a free man Wednesday, a day after the judge who presided over his 2008 trial vacated his sentence and prosecutors said they would not pursue further charges. 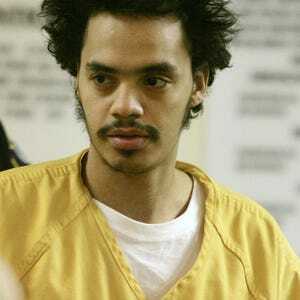 He was 14 when he was arrested for a 2007 quadruple homicide in a drug house on Detroit’s east side. “It’s been such a long road,” his family’s attorney, Valerie Newman said at a press conference Tuesday. “He’s suffered so much. He went into jail when he was 14; prison when he was 15 years old. He grew up in prison. So to think that now he’s coming out as a 23-year-old man, it’s very overwhelming in a lot of ways. The case became a national cause for innocence advocates, who pointed out that two weeks after Sanford was sent to prison, hit man Vincent Smothers confessed to the killings, providing details that included where one of the murder weapons was stashed. Law firm Dykema Gossett worked pro bono, along with the Michigan Innocence Clinic, the Northwestern Center for the Wrongful Convictions of Youth and the Michigan State Appellate Defender Office to gain Sanford’s release. Smothers has repeatedly stressed Sanford had nothing to do with the killings, which were the result of a fight between drug dealers, according to court documents and Smothers’ confession. But until Tuesday, prosecutors had steadfastly insisted they’d convicted the right person for the killings on Runyon on Detroit’s east side, and they rejected any notion Sanford was innocent. Neither Smothers nor Ernest Davis — who Smothers said helped him with the Runyon killings — were charged with the drug house killings, although Smothers is serving 50-100 years in prison after pleading guilty to eight other murders-for-hire. Davis was sentenced to up to 15 years for a December 2012 shooting of a security guard. “I cannot emphasize strongly enough that Davontae Sanford was not involved in the Sept. 17 murders on Runyon Street in any way,” Smothers wrote in an affidavit filed in Wayne Circuit Court last year. Smothers added he’d never met, or heard of, Sanford before police told him the teen had been convicted of the killings. After Wayne Circuit Judge Brian Sullivan vacated Sanford’s 37-90-year sentence, Wayne County Prosectutor Kym Worthy announced Tuesday she would file a motion to dismiss all charges against Sanford and not retry him. Worthy said she would further discuss her decision in a Thursday press conference. Tuesday’s development comes three weeks after Michigan State Police turned over the results of an 11-month investigation of the case, which, sources told The Detroit News, found Smothers and Davis — not Sanford — were responsible for four deaths. As part of the investigation, state police requested murder charges for Smothers and Davis, along with perjury charges for a former high-ranking Detroit police official who testified during one of Sanford’s appeals. Worthy in her written statement Tuesday criticized former Detroit Police Deputy Chief James Tolbert, who later became Flint’s police chief, for his role in the case. “Included in (the state police) report is a recorded interview in which ... Tolbert contradicts his sworn testimony that Davontae Sanford drew the entire diagram of the crime scene, including the location of the victims’ bodies, while being questioned by the police,” Worthy said. “This called into question Tolbert’s credibility in the case. Reached by telephone Tuesday, Tolbert declined to comment. The state police report also strongly criticized how police and prosecutors handled the case. Detroit Police Chief James Craig said he’s awaiting the results of the investigation before possibly launching his own internal probe. Since Sanford’s conviction, advocates have criticized several actions taken in the case, including the decision by police to interview Sanford hours after the murders without a parent or lawyer present; the failure to videotape the first police interview with Sanford; and discrepancies between Sanford’s first confession, in which he gave the wrong information, including the type of gun used in the crime and the number of shooters involved; and his second interview, in which more accurate details were provided. Incarcerated at 14, the 23-year-old is scheduled to be set free on Wednesday. Newman on Tuesday sharply criticized Sanford’s original attorney, Robert Slameka, who has been censured 17 times by the state Attorney Discipline Board for improperly representing clients. “One of the really tremendous failures of the system was his defense attorney. There was not one pretrial motion that was brought,” she said. “Davontae’s confession had all the hallmarks of a false confession; (it was) never challenged. Slameka, whose law license is suspended after he was convicted last year of breaking into his ex-girlfriend’s house, convinced Sanford to plead guilty to second-degree murder, telling him prosecutors had an iron-clad case, and that if he pleaded, he’d get out of prison some day. During the trial, Slameka waived making an opening statement, and never cross-examined the detective who questioned Sanford. Slameka has not responded to repeated interview requests. State officials were ready for Tuesday’s action, Michigan Department of Corrections spokesman Chris Gautz said. “We had anticipated this ruling may come in Sanford’s favor and we began moving him south from Marquette this week,” Gautz said in an email. “He was moved ... today so that he would be closer to home if the court did order his release. Newman, who has been involved in the case for years, said she was emotional when she heard the news Tuesday. “I basically started crying. I was so happy,” she said, adding that Sanford’s case is a cautionary tale.